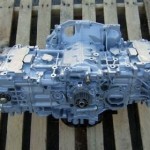 We specialize in Subaru Rebuilt Engines. Our goal was to offer a very high quality engine at a fair price that people can afford. I think that we have achieved this goal. We build them in house, and each goes through the same process. The Subaru EJ2.5 Engine has an inherent head gasket issue and a “piston slap” issue, both of which we address. Starting with our cleaning method, we clean the parts in a high pressure cleaning machine. Then we blast the block and heads in a baking soda blasting machine. Most rebuilders us a glass beading machine to clean these parts. Glass is abrasive and it is difficult to clean out the all of the glass residue from oil passages. Baking soda is non-abrasive and cleans out easily with water and compressed air leaving absolutely no residue. The Statue of Liberty was restored using this method! We completely rebuild and resurface the cylinder heads. We resurface the heads with a milling machine which gives a much better finished surface than the spinning disc method which many rebuilders use. We also resurface every block with a milling machine. Some rebuilders do not resurface the block. We believe this to be a mistake, as one side of the head gasket is going on an unflat surface. We use a triple layered stainless steel head gasket coated in heat resistant Viton. They are made by 6 Star and are the best head gaskets we have ever seen made for Subaru. We bore out every block with a Sunnen SV10 boring machine. It is a state of the art machine and cuts a perfectly round hole. The original Subaru piston has almost no skirt, causing the cylinder bore to wear in the middle, eventually causing “piston slap”. We use Hastings piston rings, which are very high quality rings. The engine comes with a new factory Subaru High Volumn Oil Pump. This is the oil pump that Subaru uses in their EJ25 Turbo Engines. We use them on our non turbo engines for better oil flow. It also comes with OEM (original equipment manufacturer) seals. The oil pan is installed also on engines thru 2004 . We do not install timing components as doing so would increase the engine cost. This would be an unnecessary cost for many that have recently replaced those parts and can swap them over from their old engine. For those that need to replace all timing components and water pump, we offer a KIT for $300 that includes all new OEM parts. This engine is built to order, and lead time is usually 1-3 weeks. Call to get a current ship date estimate.